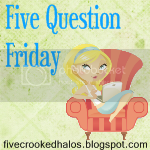 Miss Fancybelle: 5 Question Friday Again! A few years ago I watched all the Murder She Wrote reruns on cable (was it the Bio channel? ), good stuff. Diddo on the dead stuff and my hubby loves Angela! He watches murder she wrote over and over and over again... :-) I like her in Court Jester as well. Stopping by from Mama M's. Have a great weekend!